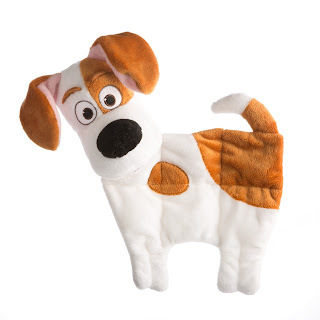 The Secret Life of Pets Mat Puppy Plush Max Dog Toy ($12.99). Max, Duke, Gidget, Chloe, Mel and Buddy, the stars of the comedy about the lives our pets lead after we leave for work or school each day, are taking over PetSmart to celebrate the release of lllumination Entertainment and Universal Pictures’ “The Secret Life of Pets,” coming to theatres Fri., July 8. As the exclusive pet-specialty retailer for the film, PetSmart will offer an array of toy, apparel and pet bed products. Together with Illumination Creative Marketing and NBCUniversal Brand Development, PetSmart has created a multi-channel shopping experience featuring the characters. As part of this partnership, pets from the movie will “take over” PetSmart stores, petsmart.com, social media and other digital channels. PetSmart Grooming Salons will offer a new Top Dog Spaw service, complete with coconut-infused shampoo, moisturizing coconut balm paw massage and an exclusive “The Secret Life of Pets” bandana. And, in keeping with the theme of the movie, what better way for pets to get in on the action than by sending them to Doggie Day Camp! Through July 31, new customers to Doggie Day Camp will receive 50 percent off their first session.